The Watering Hole, Monday, October 6, 2014: No Nukes for You! As usual, I found the topic for today’s thread while researching something else: in this case, looking for info on the time frame when Bush wouldn’t let the IAEA (International Atomic Energy Agency) finish its inspection for WMDs in Iraq, just prior to our heedless and headstrong invasion. I never finished that research, as I was distracted by more timely news. Okay, Congress and Israel, don’t get all freaked out and start shouting “mushroom cloud.” Remember the last time that we had “credible sources” about possible nukes, purportedly in Iraq, and went off half-cocked and half-assed? As Donald Rumsfeld (spit) so insultingly told under-provisioned U.S. troops to their faces, “…you go to war with the army you have—not the army you might want or wish to have…” How many thousands of American and coalition troops died, how many maimed, how many innocent Iraqis were killed? How much of their “sovereign nation” did we destroy? Seriously, do you macho politicians ever remember history, because you seem quite willing to repeat it. “American policy is American policy. They promote what they think is good for the United States of America, and they want the support of what they perceive as “moderate Arab states.” The fact that such a phrase is an oxymoron has nothing to do with anything. Let the USA do whatever it wants. My complaints are against the Israeli Government, Binyamin Bibi Netanyahu’s government coalition. Israel is supposedly an independent country and has been since the 1949 Armistice, which ended the active fighting between the newly established State of Israeli[sic] and the surrounding Arab countries, which had attacked it. Oh, my, where do I start with this bit? How about, if it weren’t for the U.S. and its allies, the State of Israel would not exist? Or, AIPAC is the biggest and probably most powerful lobby in the United States? Or, how much money and military equipment and assistance has the U.S. given to Israel throughout its existence? Or, didn’t you guys actually start some of those “wars against us by our Arab enemies”? Or, Israel doesn’t “beg the United States for support and friendship”, it demands it unconditionally and unswervingly, then spits in our faces. And when we politely ask that Israel restrain itself a tad when they’re violating the conditions of the 1967 agreement by bombing their neighbors and taking their neighbors’ land, Israel considers it an affront to their sovereignty. Bite me, Israel, you can stop taking our money and assistance, we can certainly use a few extra billion dollars right here. As to Israel’s worry over the possibility of Iran hiding the development of a nuclear weapon, all I can say is, how big is Israel’s nuclear stockpile that Israel denies exists? This is our daily open thread – don’t mind me, feel free to discuss whatever you want. As much as $60 billion in U.S. funds has been lost to waste and fraud in Iraq and Afghanistan over the past decade through lax oversight of contractors, poor planning and payoffs to warlords and insurgents, an independent panel investigating U.S. wartime spending estimates. As the 10th anniversary of President George W. Bush’s invasion of Iraq approaches, the body charged with overseeing Iraq’s reconstruction has issued its final report, capping a tale of spending far too much money for very little results. There is much more at the two links above. The question is how will this all turn out to be President Obama’s fault? George W. Bush stopped being responsible for anything the day President Obama was inaugurated in 2009 according to the GOP. THIS IS TODAY’S OPEN THREAD. GO AHEAD AND VENT. Numbers may increase with every click on the link. We all agree, that Iraq is a postwar society, plagued by ethnic conflicts and a weak government. We all agree that the United States of America is not that. Or do we? This is an open thread. Comment on this, or on anything else that comes to mind and have a wonderful Sunday everyone. As Rachel Maddow so perfectly pointed out recently, John McCain’s regular – some might say ubiquitous – appearances on so many of the Sunday morning political talkfests only serve to show McCain’s desperation to remain relevant at any cost. Unfortunately, that ‘cost’ seems to be the remnants of McCain’s respectability along with the shards of his integrity. McCain’s latest insanity is shown in his recent calls for a “Watergate-style” investigation of U.N. Ambassador Susan Rice regarding the Benghazi, Libya, attack. McCain’s rabid and, IMHO, unfounded attacks on Ms. Rice (including calling her “not very bright”, and his vow to block her possible nomination as future Secretary of State) were supposedly tempered a trifle yesterday, if by ‘tempered’ one means asking for the same information from Ms. Rice, presumably sans the “Watergate-style” investigation. Regardless, McCain still will not say whether, even if he (undeservedly) receives the requested information from Ms. Rice, he would consider NOT blocking her possible future nomination for Secretary of State. HOST: You say that you will do everything in your power to block Susan Rice’s nomination if the President decides to name her to be secretary of state . . . . Is there anything that Ambassador Rice can do to change your mind? MCCAIN: Sure, she can give everyone the benefit of explaining their position and the actions that they took. And I’ll be glad to have the opportunity to discuss these issues with her. Why did she say that al Qaeda has been decimated in her statement here on this program? Al Qaeda hasn’t been decimated. They’re on the rise. They’re all over Iraq. Yes, John, of course Al Qaeda is “all over” Iraq, sure they are…NOT. McCAIN:… And as far as young women are concerned, absolutely. I don’t think anybody like me, I can state my position on abortion, but, to — other than that, leave the issue alone. When we are in the kind of economic situation and, frankly, national security situation we’re in. CHRIS WALLACE (HOST): When you say leave the issue alone, you would allow, you say, freedom of choice? McCAIN: I would allow people to have those opinions and respect those opinions and I’m proud of my pro-life position and record, but if someone disagrees with me, I respect your views. So, that would be a ‘NO’ to ‘freedom of choice”? Since the 2008 Presidential election, when Senator McCain foisted Sarah Palin on us, it seems that his tenuous ties to reality, and his sense of decency and honor, have rapidly strained to the snapping point. 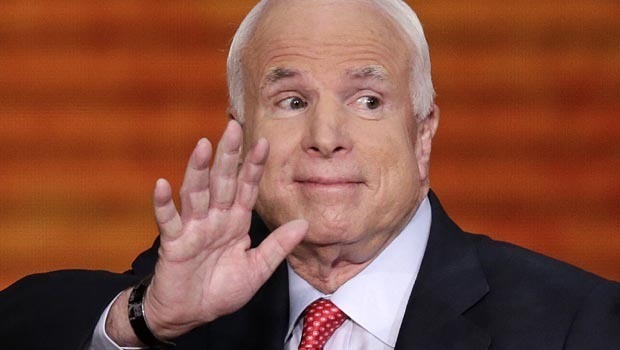 I think that we all agree (and I wouldn’t be surprised if many in the Republican heirarchy agree, too), that it’s way past time for McCain to, shall we say, spend a lot more of his time at one of his seven -or was it eight? – homes. This is our Open Thread. Feel free to discuss this topic, or anything else that comes to mind. While we’re all still on a bit of a contact high from President Obama’s excellent performance in Tuesday night’s debate, the final Presidential Debate, supposedly covering U.S. foreign policy, looms just around the corner. As a follow-up to my post on Monday, I’m offering two pertinent articles from Foreign Policy magazine. The second, as I mentioned on Monday, is a return to Mitt Romney’s recent foreign-policy speech at VMI (Virginia Military Institute.) While I find it disturbing for a Presidential candidate to be obviously undermining his audience’s Commander-in-Chief, even more disturbing were Romney’s comments about the recent tragic attack on our embassy in Benghazi. This line in particular jumped out at me: “These mobs hoisted the black banner of Islamic extremism over American embassies on the anniversary of 9/11.” I’m still looking, but I have not found ANY independent corroboration of this little tidbit. The following are a few more excepts. Of course, it figures that Romney is a proponent of an Obama Administration policy with which many of us liberals take great issue. Based on this attitude, Romney wants to pour an unnecessary and unasked-for $2 trillion-with-a-T into the Department of Defense. “I’ll work with Israel to increase our military assistance and coordination. For the sake of peace, we must make clear to Iran through actions, not just words, that their nuclear pursuit will not be tolerated. In other words, Romney has no plan for the Middle East. Does this mean that Romney’s believes in “hopey-changey”? I also ran across this interesting and helpful analysis on Romney’s VMI speech, by Andrew Quinn. This is our daily open thread–what do YOU have to say? “According to a University of California, Santa Barbara archive of formal campaign speeches by both candidates, Romney has used the word “Iraq” seven times on the trail (usually in the context of military service) while Obama has referenced the country 76 times (often as part of a stump-speech line about keeping his promise to end the war). The same pattern held true at the conventions: Republicans mentioned Iraq seven times, while the Democrats did so 34 times. Romney didn’t talk about Iraq in his convention speech and made only a passing reference to it in his biggest foreign-policy address of the campaign in South Carolina. That line sounds familiar, doesn’t it? Ann Romney, when stating that “you people” weren’t going to be allowed to see any more of the Romneys’ tax returns than what was ‘legally required’ – a phrase that both she and Mitt seem to be fond of – because it would just give “more ammunition” to the pundits and political opposition. Too bad…if the TRUTH would give your opponents ammunition against you, then you really aren’t Presidential material. Next up: I had also recently mentioned an effort by two Catholic groups, Catholics United and Faithful America, to keep politics out of Sunday Mass. Faithful America’s website has an interesting listing of other political causes, working against the radical right-wing religious zealots. And lastly, a piece from our local Patch online newspaper, which discusses a poll taken of ‘New York GOP Insiders’ regarding Romney’s chances post-“47%” remarks from the recently surfaced Romney fundraising video. Some of the comments here are worth reading. Speaking of the Romney fundraising video, I would like to thank James Carter IV for his efforts in finding the video and for getting this amazingly damning revelation of Romney’s character into the public arena. And, of course, special thanks to whoever actually made the video. This is our Open Thread. Speak Up on any topic that you choose. The Watering Hole, Monday, July 9th, 2012: What’s Iraq Got That We Ain’t Got? “Please share this – Republicans started the Iraq War to oust a dictator and install Democracy. Republicans wrote and approved the Iraq Constitution which includes Universal Health Care. Over 4300 AMERICAN MILITARY PERSONNEL WERE KILLED so that Republicans could give ALL Iraqi Citizens Health Care; but Republicans don’t believe that 30 million American Citizens deserve Health Care? When I was reading the WaPo article, I noticed that a friend of TheZoo (under her real name) had also linked to the article, so I knew that I had to look into it further. in the internal affairs of other states, seek to settle disputes by peaceful means, establish relations on the basis of mutual interests and reciprocity, and respect its international obligations. Article 9: B The formation of military militias outside the framework of the armed forces is prohibited. Article 28: Second: Low income earners shall be exempted from taxes in a way that guarantees the preservation of the minimum income required for living. This shall be regulated by law. environment and its biological diversity. …wouldn’t it be nice if the U.S. government guaranteed some of those rights to our citizens?